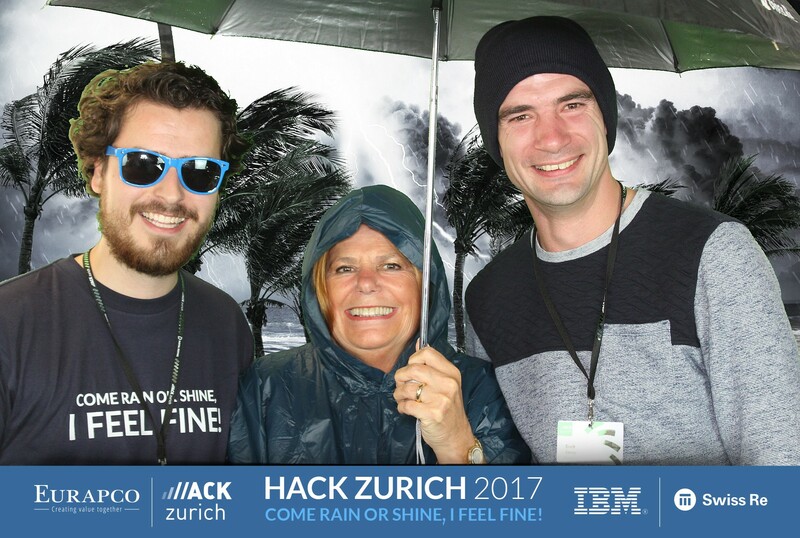 From 15 till 17 September 2017, HackZurich took place. With over 500 participants from over 50 countries it is the largest and most prestigious hackathon in Europe. During this hackathon, the participants spent over 40 hours working on highly innovative prototypes for web, mobile and desktop applications. Eurapco, Swissre and IBM teamed up to sponsor the event. We created a promotional stand where participants could learn about us and take pictures in our photobooth. They got to take home some goodies such as umbrellas and sunglasses and we encouraged them to stop by our workshop to learn about the challenge we came up with for them. We were not just showing up there with a stand, we were providing a challenge to our participants. We gave them an opportunity to work with the latest technology and data and put their knowledge and experience into practice. Eurapco also brought some participants. We had 15 participants from Caser, Gothaer, Länsförsäkringar, Reale Group and Swiss Mobiliar. For me it was great to see so many young, talented people come together to innovate. It is so important for us to realize that nowadays it is easy to innovate and to create concepts from great ideas. A founding engineer of Pinterest speaking at the event said: ‘’When people ask me how much it takes to found a startup, I tell them it is $1,108. A $1000 for the laptop, $100 for the developer license and $8 for some time on Amazon. The rest is a lot of hard work and dedication. It means anybody can be an entrepreneur and anybody can test out their success without ever needing to get any capital.’’. I believe that organizations need to start involving this young talent in their business. We can learn so much from them. So, what was the challenge we presented to them? Weather! IBM provided real data from The Weather Company, so that the teams could use this data for their projects. I’m so glad we could use this topic for HackZurich. It is such an urgent topic not only for our industry but for many other industries. Recent hurricanes such as Harvey and Irma have shown that we need to create services or products that can protect people from weather disasters. And when a disaster does happen, we as insurers need to do what we can to restore affected areas. The teams that took on our challenge used the data to find a solution for tackling the impact of weather. For example, they could use the data to develop a pre-warning system or to tell people what insurance to buy now because bad weather is looming. We had 10 teams who took on our challenge. Two of these teams made it to the top 25 with their prototype, meaning that they could pitch their idea to the judges. A big congratulations to the team of Länsförsäkringar and Achmea! What some of the teams came up with? The app TravelFrog recommends you your best available upcoming trips, depending on the weather conditions and your travel interests. You can then directly book and add insurance products to your booking. Weatherly is an app that alarms and gives users recommendations based on their location, habits, hobbies and other things. The recommendations come with targeted on-demand insurance options. As Eurapco we will keep in close contact with the participants that came to HackZurich, to see how we can develop the prototypes further within the alliance. What do you think of this event? Would you be able to work for 40 hours and deliver a prototype on Sunday? I would love to hear your thoughts.